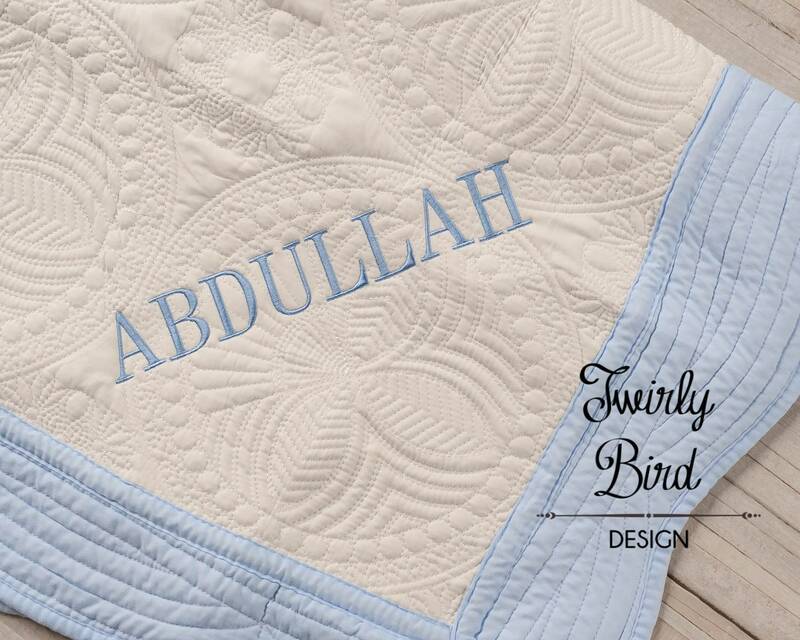 You can chose to personalize the baby quilt with monogram or baby's name and select your own thread color to match your nursery! 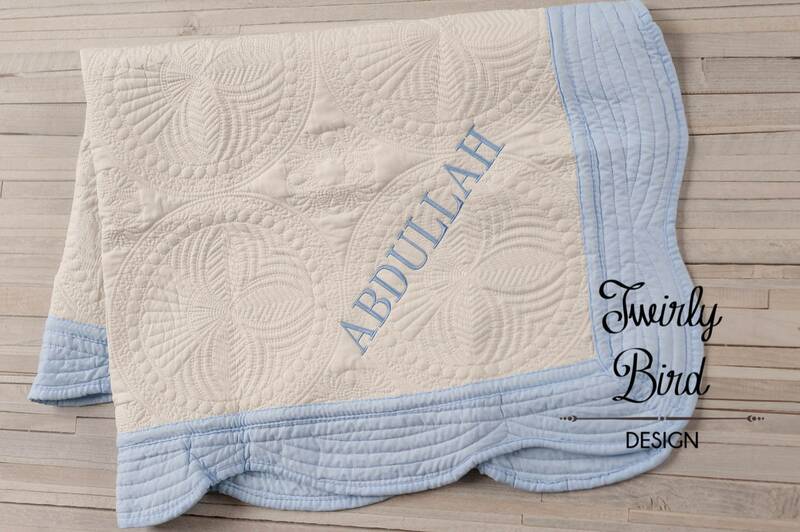 When you check out there will be a section to add notes - please list the baby's initials or first name. Please wash all your embroidered and hand made items in cold water and hang to dry! To fulfill your order, you must provide me with certain information (which you authorized Etsy to provide to me), such as your name, email address, mailing address, payment information, and the details of the product that you’re ordering. You may also choose to provide me with additional personal information (for a custom order, for example), if you contact me directly. For purposes of EU data protection law, I, Lindsey Dansak, am the data controller of your personal information. 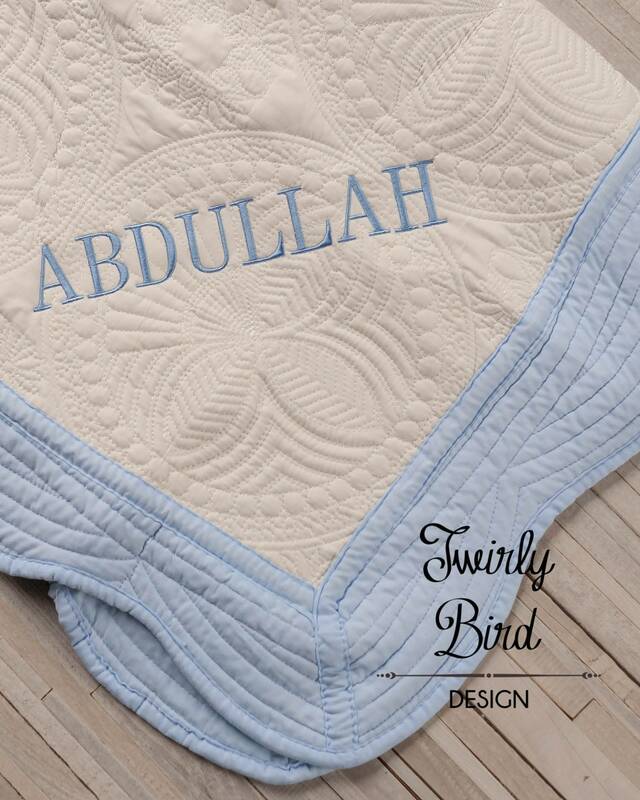 If you have any questions or concerns, you may contact me at admin@twirlybirddesign.com. Should I go with Newborn or 0-3 Months for a Going Home Outfit? My experience has been that both of my babies could not wear 3 months size outfits at birth and I had large babies (8lbs). A lot of mom's have the same question for me so I always say if you are buying this for a take home outfit from the hospital I would go with newborn. If you want to get more use out of it go with 3 months. What is the turn around time? Is there a rush option? When you check out you will be asked to select USPS Priority or First Class Shipping as well. Priority shipping is 1-3 days once it leaves here. First class is 3-5 business days. How do I care for my embroidered items? Please wash all your embroidered and hand made items in cold water and tumble dry low. You can put a towel over the embroidery and warm iron to remove wrinkles.